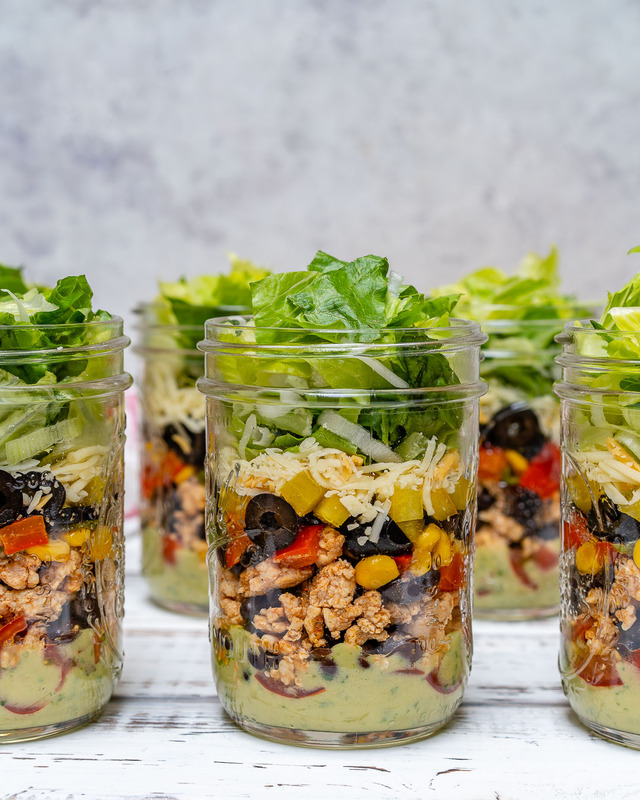 Fiesta Taco Salad-in-a-jar with Creamy Avocado + Cilantro Dressing for Meal Prep! 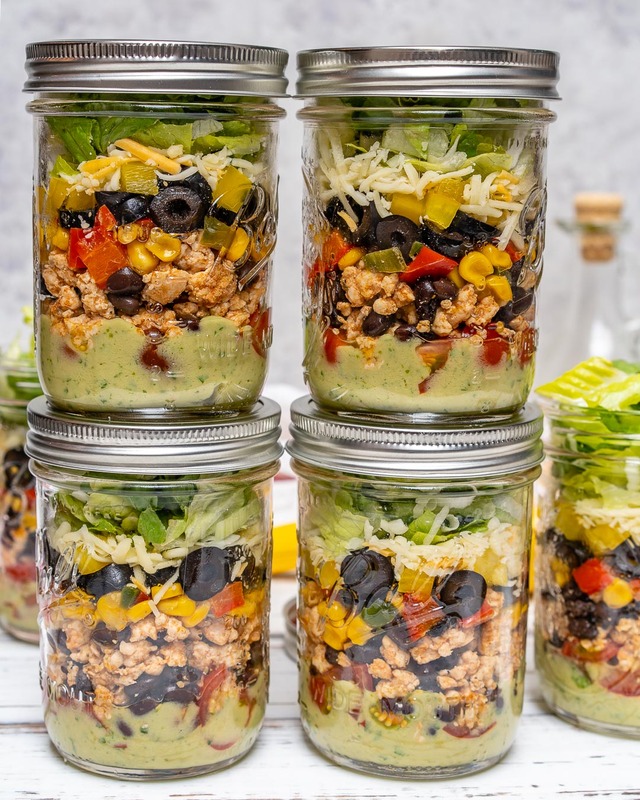 😍🥑😜🔥The ULTIMATE in grab-n-go meals for your week ahead! 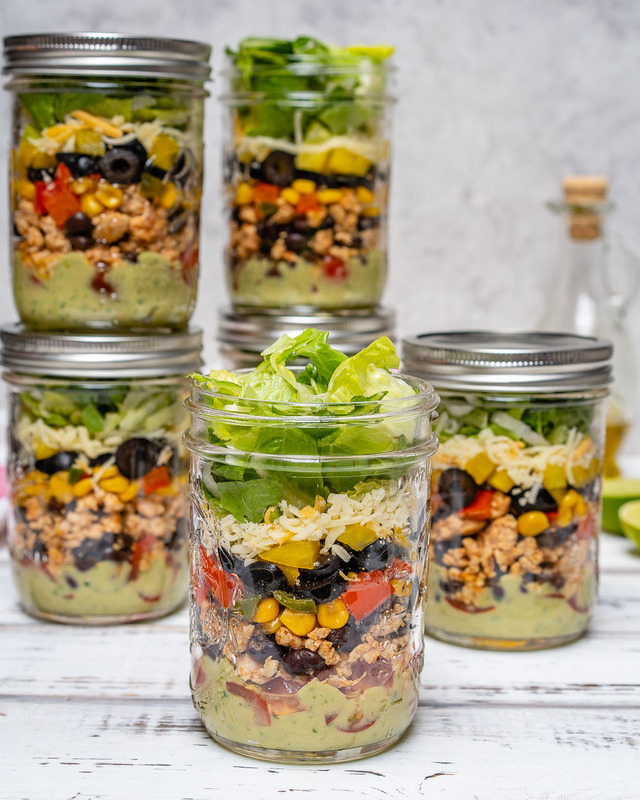 These salad jars are stacked with flavors, textures, and energy boosting nutrients! This recipe requires a bit more prep and ingredients…but it’s SO worth it! Read recipe to the end before planning out your jars! 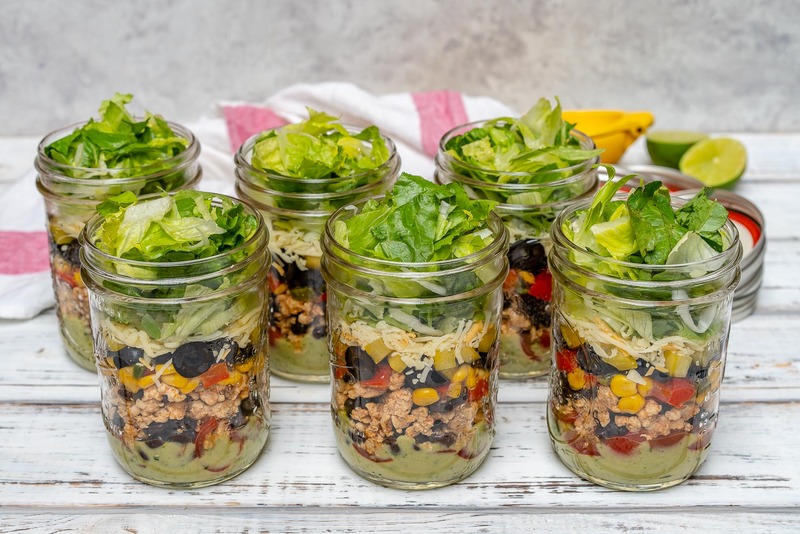 The avocado dressing and grass-fed beef instructions will make enough to assemble 6-8 jars. The single serving jar quantities and “stacking” order are listed directly below. 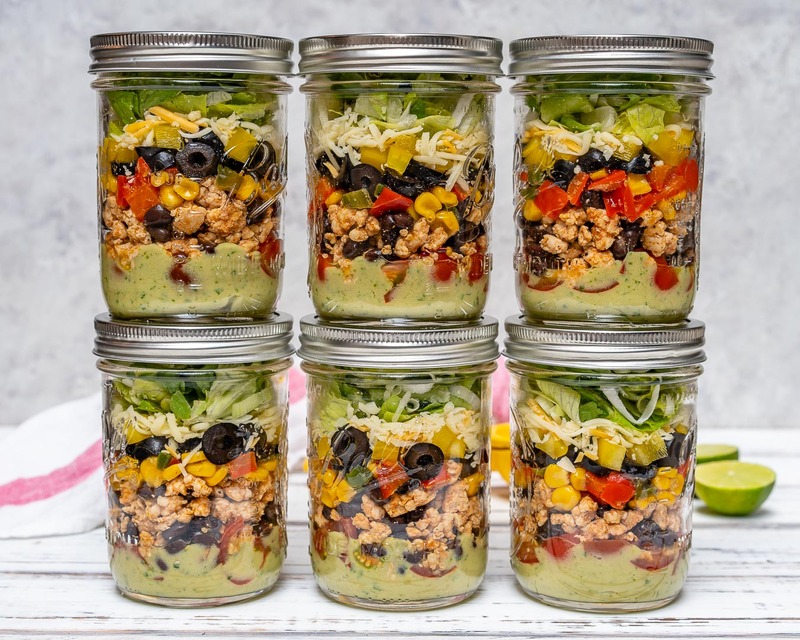 Use Wide Mouth Pint and Half Jars with Lids, or whatever sized salads you want to make! 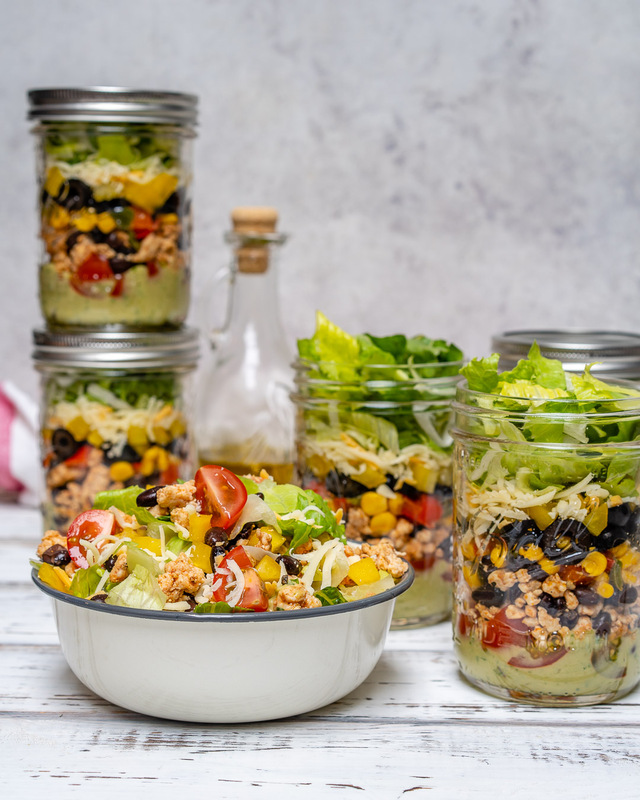 Place all your dressing ingredients into a food processor or high-speed blender. Process until smooth, stopping to scrape down the sides. Thin out the salad dressing out with about 1/4 cup cold water (more or less) just until you get your desired consistency. Keeps well in an airtight container for 1 week, refrigerated. Makes 6-8 servings of dressing. 1/2 tsp each of chili powder, onion powder, granulated garlic, paprika, and turmeric. Add sea salt and fresh black pepper if desired. Adjust to taste I always add more seasonings at the end if desired. Makes enough for 6-8 salad jars. Remove cooked, and seasoned meat mixture from pan, allow to cool, then place in a bowl add black beans and gently stir to combine. 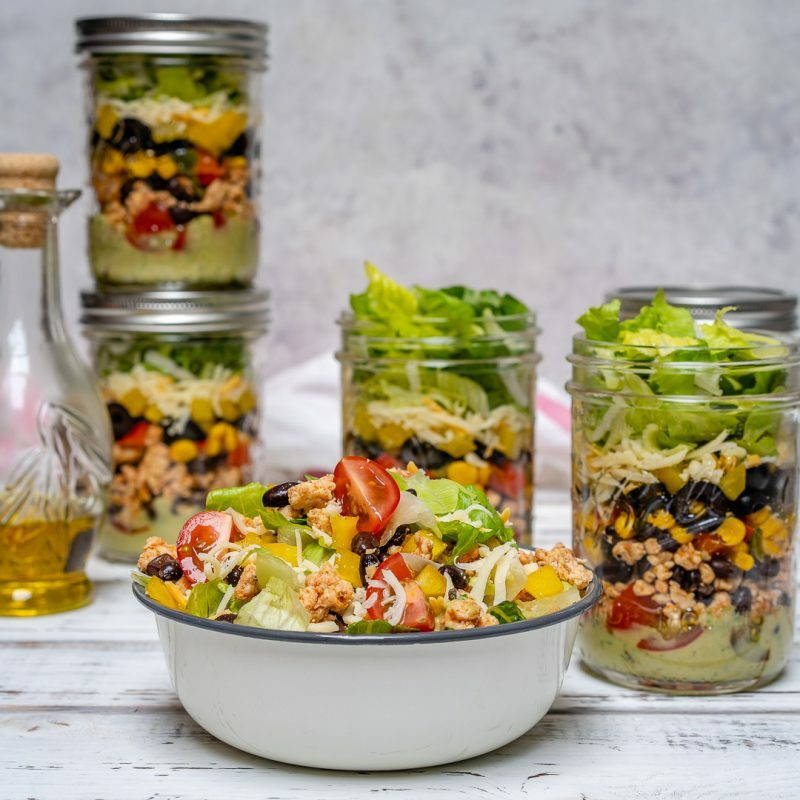 Using a cast iron skillet heat 1 Tbsp of avocado, or olive oil, then add in this order 1/2 diced green bell pepper, 1/2 of a diced red bell pepper saute for 2 minutes add the corn cut and removed from 2 cobs and 4-6 ounces diced roasted green chilies. Saute all together for 3-4 minutes on a med-high heat…don’t over roast this mixture, you want it firm. 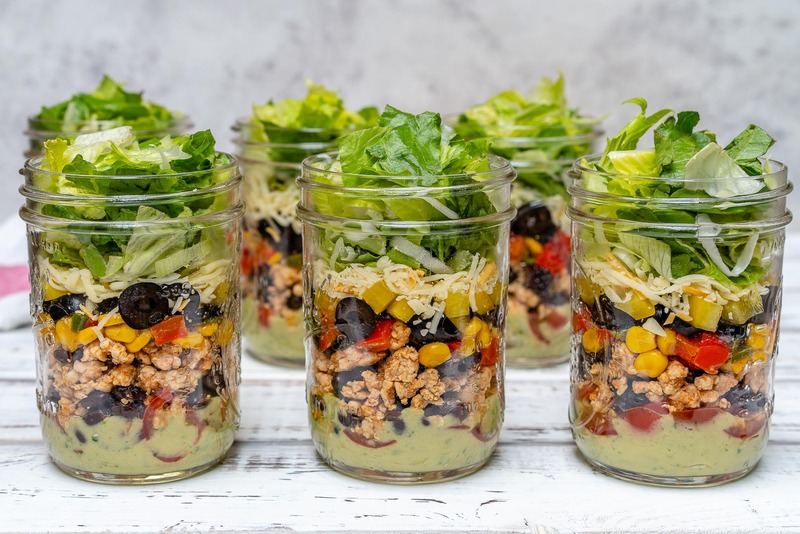 Assemble your salad jars in the order first mentioned above. These stay well for 3-4 days, sealed well in the refrigerator. Saute all together for 3-4 minutes on a med-high heat...don't over roast this mixture, you want it firm.